Join the mega revolutionary event on June 23, 2017, International Widows Day at Lal Bahadur Stadium, Hyderabad, Telangana. The largest gathering of 10,000 widows will be the voice of the most abused and discriminated section of the society. The condition of widows in India is pathetic due to the age-old customs and superstitions among the poor and rural communities. The widows face discrimination, violence and abuse in their daily lives as they lost their rights, respect and dignity. While the rich, educated and empowered women are enjoying equality, a majority of the widows continue to suffer due to the old mindset. According to a survey, twenty-nine percent of the widows attempt or think of suicide. This indicates the severity of the issue as problems of widows and their children remain invisible. Therefore, Bala Vikasa is striving to bring social justice to the widows by creating awareness among general public and accept them as human beings, give equal rights, and provide an opportunity to succeed in life. 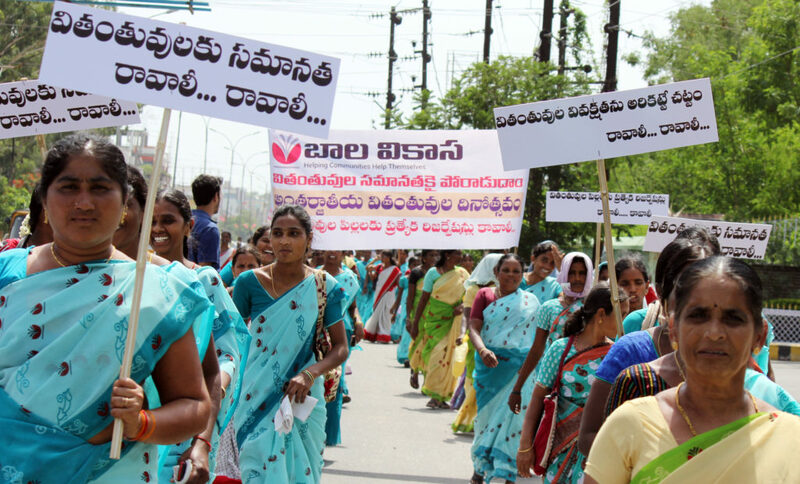 This year, Bala Vikasa is organising a mega event with 10,000 widows drawn from all over Telangana state at Hyderabad on June 23. This is the first of its kind event with a large number of widows gathering in the country. This event is a collective movement to bring attitudinal change and behaviour especially in eradicating the age old traditions and superstitions towards widows and create an inclusive culture in the society. To take this initiative forward, Bala Vikasa has promoted a “Movement for emancipating widows from discrimination” by pooling women, farmers, youth, networking with other NGOs, religious institutions, government bodies, people representatives, and media. This movement is becoming stronger with a wider network of key institutions, political leaders, public representatives, social activists and individuals. District level seminars are being organised involving thousands of people from all sections of society with the help of local leaders and officials. With the success of these district level seminars, a state level event is now planned for a larger impact. How long should widows accept these heinous traditions? Is it not a denial of their human rights? Who benefits from these superstitions? Is it you, me, or who? Why is a woman blamed for husband’s death? Stalwarts and commoners are coming together to fight against these social stigmas. Be part of eliminating these age-old traditions and create a new world for the people around you. Be part of the convention at L.B. Stadium, Hyderabad on June 23, 2017, in Telangana, India on International Widows Day. This is a one of a kind event with the participation of more than 10,000 widows. Please be part of the movement and make a CHANGE.